As someone whose greatest fear at any gathering I host is running out of food (or worse, wine), I feel a compulsive need to contribute to any party I attend. While my friends appreciate the generosity, my motives are not as selfless as they appear. You see, while I want the appetizers I bring to be crowd pleasers, I also bring something I personally intend to devour. 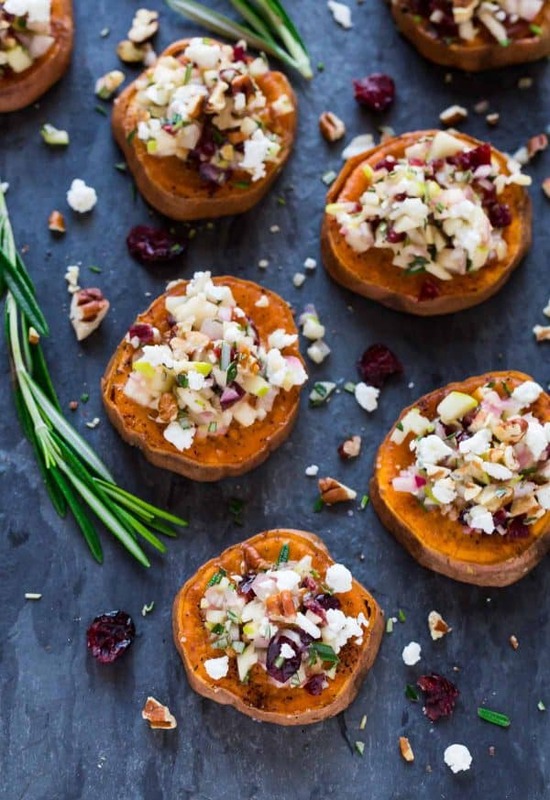 These Sweet Potato Rounds with Goat Cheese, Cranberry, and Pecans? Guess who inhaled the majority of them at the party to which she just brought them? Oven-roasted sweet potato slices that are baked until golden, then piled high with some of the best ingredients of the season (and life in general)—goat cheese, tart apples, sweet cranberries, and toasted pecans—these addictive little rounds are the sort of appetizer I simply cannot stop eating, for many reasons. They’re both sweet and savory. It’s a combo that speaks to my tastebuds. I must listen to my body and help myself to a second sweet potato round. They involve a vegetable! Vegetables are healthy. My third sweet potato round is completely justified. Also fruit! Cranberries + apples. Clearly I need to have a fourth. Wait? Aren’t I supposed to have FIVE servings of fruits and vegetables a day? Best grab another. Of course I care deeply that the other guests enjoy the appetizers I bring too, and I was not the only guest hovering around the plate of sweet potato rounds with goat cheese. I also like to provide something healthy (or at least healthy-ish) so that the overall spread includes at least one wholesome option. Because this appetizer’s base is healthy baked sweet potato slices, it’s actually reasonably good for you without being as overtly healthy as the hummus and veggie tray. No offense to raw celery and carrot intended—I simply want something a bit warmer and more festive to eat while I’m sipping Christmas Punch. I first discovered the beauty of turning sweet potato rounds into an easy appetizer back when I made these Sweet Potato Bites with Avocado and Bacon. Today’s recipe puts a holiday spin on that same concept by swapping the avocado and bacon for classic fall and winter ingredients that pair beautifully together. If you aren’t a fan of goat cheese, you can easily use feta or a mild blue cheese instead. I’d be hesitant to omit the cheese entirely, as it gives the topping creaminess and helps it hold together. If you are looking for sweet potato rounds that are Paleo or dairy free, I’d suggest the Sweet Potato Bites with Avocado and Bacon, since those fit both categories already. The goat cheese, cranberry, and apple topping is wonderful on its own, so I can also see it working well on top of crackers (I was practically eating it out of the bowl with a spoon), but I loved it so much on the baked sweet potato slices, I highly recommend giving the recipe a try as written first. The sweet potato rounds will soften a bit as they sit, but they still taste delicious and are tasty served at room temperature too. 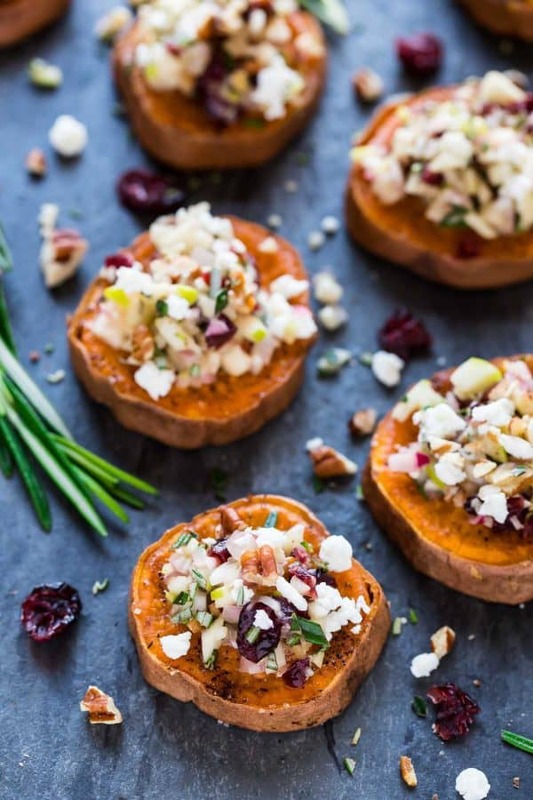 Baked Sweet Potato Rounds topped with goat cheese, cranberry, apple, and pecan. 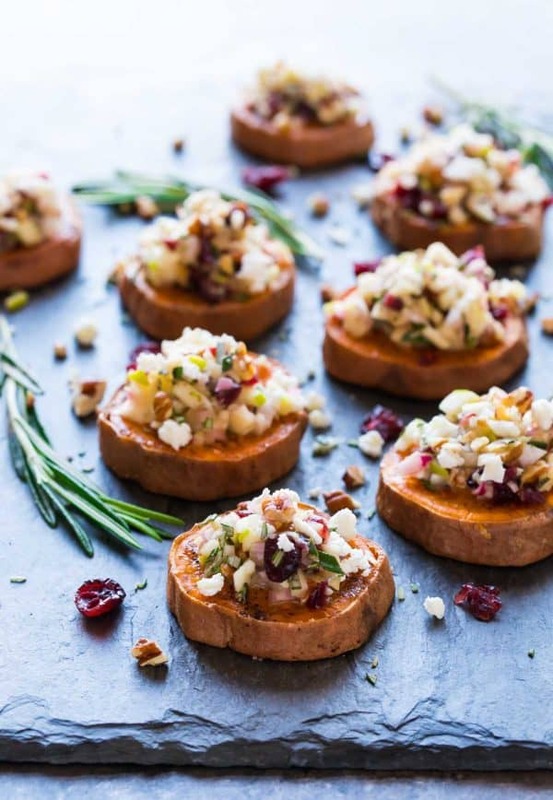 An easy, healthy sweet potato appetizer that's quick to make and delicious! Place baking racks in the upper and lower thirds of the oven and preheat the oven to 425 degrees F. Line two rimmed baking sheets with foil. Brush the sheets with 1/2 tablespoon olive oil each. With a very sharp knife, slice the sweet potatoes into 1/2-inch slices. Arrange the slices in a single layer on the oiled baking sheets, then brush the tops with the remaining 1 tablespoon olive oil. Sprinkle with salt and black pepper. Bake for 15 to 20 minutes, until golden brown underneath, rotating the pans 180 degrees and changing their positions on the upper/lower racks halfway through. Remove the pans from the oven, flip the slices over, then roast for an additional 5 to 8 minutes, until tender. While the potatoes bake, in the bottom of a small mixing bowl, whisk together the vinegar, Dijon, and maple syrup. Finely chop the pecans, shallot (you should have about 1/4 cup), apple (no need to peel; you will have about 1/3 cup), and cranberries. Add them to the bowl with the dressing and sprinkle with the rosemary. With a rubber spatula, toss to coat with the dressing, scraping the spatula along the bottom of the bowl so that the ingredients are well moistened. Fold in half of the goat cheese. When the sweet potatoes are finished, let them cool slightly, then transfer them to a serving plate. Top with the pecan mixture, then sprinkle with the remaining goat cheese. Enjoy immediately. The topping can be prepared up to 1 day in advance and stored in the refrigerator. You can also roast the potato rounds in advance, then rewarm them in an oven just before serving. The bites will soften as they sit but taste great at room temperature, even if they are a bit soft. Sorry to leave you with the odd half of an apple left over! I usually try to avoid this, but the whole apple was just too much (and it was too yummy WITH the apple to omit it entirely). I suggest you snack on the remaining half while the bites bake...or save it for these Apple Cinnamon Overnight Oats. This sounds like a really great idea. What immediately struck me was that one could do a version of this with the wonderful cranberry/cinnamon goat cheese roll I get every year at Costco (it’s one of those things that is so good I can’t refrain from buying and eating it). That does sound like a perfect goat cheese to use, Susan! I hope you enjoy the recipe if you give it a try! These look absolutely fantastic! 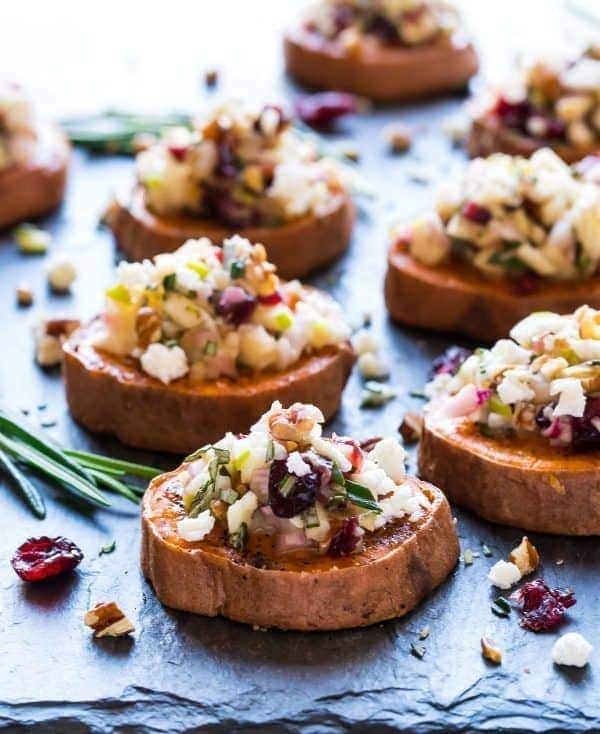 I absolutely love goat cheese, and really all of the toppings for this sweet potato round, so I think making these is in my near future. Thanks Danielle! I hope you enjoy them! Oh, Erin, these are all my favorite ingredients! I would never have thought to put them all together like this! I think these will become my “go-to” appetizers! Thanks for another great recipe – so festive! It sounds like this appetizer is perfect for you, Laurie! I hope you enjoy! These are beautiful and seriously sound so delicious! OMG, this is literal appetizer goals!! I can’t wait to try these! I love the addition of Granny Smith Apple on there. YUM. Hooray Jennifer! I’m so happy to hear these were a hit. Thanks for giving them a try for your party and for reporting back! Did you actually leave the peel on? I did Lisa! The peels didn’t both me and saved time. You can peel the potatoes first if you prefer. Looking forward to taking these as an appy for Xmas party! A little concerned the won’t be right of oven, so wondering if anyone else has traveled either short distance? Also I am wondering why leave peel on, does guest not have to remove to eat? Lisa, the peels didn’t bother us at all, but you can peel first if you prefer. For a short distance, they will travel fine. For longer, I’d suggest topping right before serving. I hope you love them! Can you substitute Feta cheese? Ann, I think that would be delicious!! I hope you enjoy the recipe.